The Spice Bazaar in Istanbul is one of the city’s largest bazaars. It can be found in Fatih, which is a neighborhood of Eminönü. This bazaar is the second largest shopping complex that is completely covered, after the Grand Bazaar. It is open every day of the week and it closes at 6 p.m. The Spice Bazaar has an “L” shape to it. The structure has eighty-eight vaulted rooms. Most of the rooms are separated into lower and upper levels. There are monumental gateways at the ends of each of the halls, with chamber areas above all of the entrance ways. The primary entrance is located in the southwest corner, and it faces the Yeni Mosque. 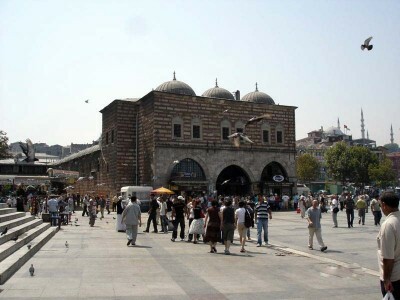 This busy marketplace was constructed in the 1660’s to be part of a new mosque complex. The rents from all of the shops were going to be used to support the mosque, as well as its charitable activities. Back then, it was named the Egyptian Market since it was very famous for selling items from Cairo. In addition to baharat (spices), the Spice Bazaar sells honeycomb, nuts, olive oil soaps and all kinds of other food items. They sell figs by the truckload, as well as pestil, which is dried sheets of fruit. One of the popular shops is the Malatya Pazari. It sells delicious, high-quality nuts and dried fruits. The Ucuzcular Baharat shop sells an amazing amount of different spices. Even though many shops sell the usual tourist trinkets, there is a nice shop that sells edible souvenirs. The Mehmet Kalmaz Baharatçi shop sells special potions, lotions, henna and the sultan’s personal aphrodisiac. The majority of the shops have vacuum packaging, and that makes it really easy to pack items in suitcases for the trip home. On the west side of the Spice Bazaar there are outdoor stalls that sell fresh produce and food items from Anatolia. Also, the Hasircilar Caddesi is located here on a narrow street. They sell spices and many other goods often at much lower prices compared to other shops in this marketplace.